What are my degree options for a career in photography? Photography is not a cubicle, nine-to-five job. This career is conducted in a hands-on environment where you use editing software, cameras, and other equipment. The plethora of industries that necessitate a photographer’s skill-set, gives you even more control over the type of work that you can do on a daily basis. A photography degree will allow you to showcase your skills, and make you a more desirable candidate to potential employers and clients. A career in photography provides endless opportunities. Finding a branch of this field that is right for you can depend on if you like to travel, or how much of your own money are you willing to put into your art form. Take a look at these popular categories of a photography career, and discover which one interests you. Portrait photographers can choose to specialize in taking yearbook photographs at a school, capturing memories at a wedding, or working at a studio all day. No matter which venue they choose, a portrait photographer shoots individuals and groups of people with the goal to make their clients look their best. Commercial photographers will take pictures for advertisements which can include fashion, real estate, or even landscapes to promote vacation destinations. They typically shoot on-location rather than in a studio. Wildlife photographers take pictures of, you guessed it, wildlife. This is an exciting branch of photography because you can and should travel all over the world to photograph nature in action. 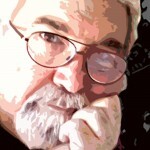 Fine arts photographers have a great deal of creative license with their work. They can be freelancers and may or may not have their own private studios. Fine arts photographers typically sell their work to art galleries, individuals, and/or public and private organizations. Aerial photographers specialize in taking photographs while in a plane or helicopter in order to capture a birds-eye perspective. These photographers must use equipment that can counteract the instability of their location so as to produce clear, high-quality images. Scientific and medical photographers can either take pictures as part of research or advertisements for that field. A microscope is commonly used, in addition to other camera equipment, to help the photographer capture the best image. News photographers are also known as photojournalists, and may either work with a news company (television, journal, magazine, or newspaper) or primarily do freelance work that is then submitted to various news outlets. Their goal is to photograph history in the making in an evocative manner. Sports photographers must have a great sense of timing in order to get the perfect shot. The players, referees, coaches, and fans all move quickly with no regard for the camera, so it is up to you to seize the moment when the time is right. There are some instances that are not as fast paced, like during a press release (this can crossover into photojournalism) or a promotional photograph for a team. 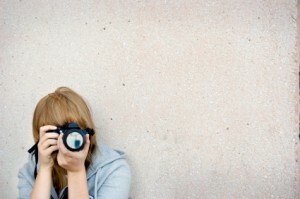 You can choose to work as a freelancing artist or as a hired company photographer in any of these photography sectors. While you can have a large quantity of pictures in your portfolio from experience, you can have greater quality photographs in you portfolio based on the education that you received from earning your photography degree. An employer or client would rather see several excellent pieces of your work rather than a multitude of mediocre shots. The Bureau of Labor Statistics (BLS) projects that photography will steadily increase at a rate slightly lower than the national average for all occupations from 2012-2022. However, the demand for professional portrait photographers is expected to grow a bit more quickly, as people will continue to need head-shots and portraits for professional and personal reasons. Additionally, corporations will continue to need competent photographers to produce images for advertising purposes. All this means is that your photography degree will really come in handy, since you will know how to market yourself in this ever-competitive field. Moving to or marketing your portfolio to any of the states in the darkest shade of green in the map below may increase your chances of being hired, since they have the highest levels of employment in the country. 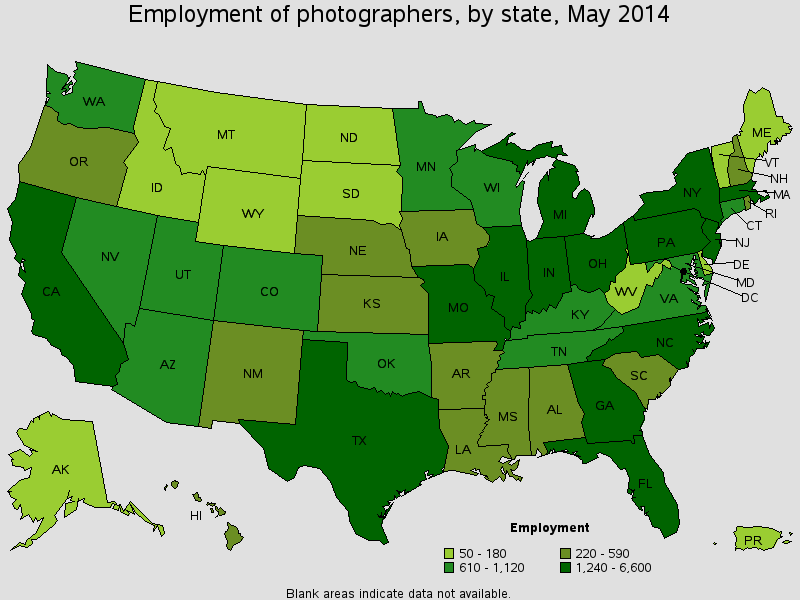 Keep in mind that these numbers do not include self-employed photographers, who sell their work in the same states as a regularly employed photographer. As with most careers, you are more likely to increase your potential life-time earnings by having a photography degree. Market and advertise services to attract clients. Analyze and decide how to compose a subject. Use various photographic techniques and equipment. Capture subjects in commercial-quality photographs. Enhance the subject’s appearance with natural or artificial light. Maintain a digital portfolio, often a website, to demonstrate your previous work. Advance your own style by encouraging you to think creatively. By pursuing a photography degree, you are expanding your knowledge of both the photography and the business world. An online degree program will have all of the same career-service features as a traditional program, with the added bonus of gaining more practice conducting business and marketing yourself online. An online presence is crucial for a photographer, and there are few places that are more suited to teach you how to increase your digital mark than an online photography degree program. You have a few options to consider when it comes to pursuing a photography degree. Which one you choose depends on your college and career goals. If you’re just starting out, an associate degree might a good option or perhaps a bachelor’s degree if you can commit three or four years to your education. If you’re interested in learning more about specific photography programs, we’ve created a list of popular options below. View more programs in Art and Design. If you would like a change of pace from photography, there are several other similar careers that you could pursue. Visual arts and design is a vast field, and any of these careers can give you the opportunity to utilize your creative expression skills while garnering wages. With the proper education, you can have to know-how to succeed as a professional photographer and business expert. Develop your career by taking a snap-shot around our website, and enroll in a degree program today.